A parallel circuit has two or more components connected across each other. Since this allows the current to flow along multiple paths, the current value will often be different on each branch. On the other hand, the applied voltage will be the same across all parallel branches of the circuit. 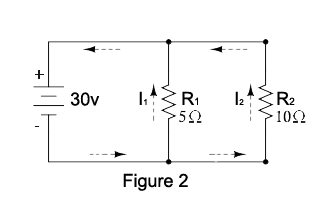 Figure 2 above shows a parallel circuit. The current leaving the negative terminal of the battery divides with some current passing through the R1 branch and some passing through the R2 branch of the circuit before returning to the positive terminal of the battery. Knowing the values for R1 and R2 plus knowing there is a 30 volt drop across both resistors allows you to calculate the current passing through each resistor using Ohm&apos;s Law. Itotal = V/Rtotal = (30 volts) / (3⅓ ohms) = 9 amperes which is equal to the sum of the two current drops, I1 and I2. How about that?